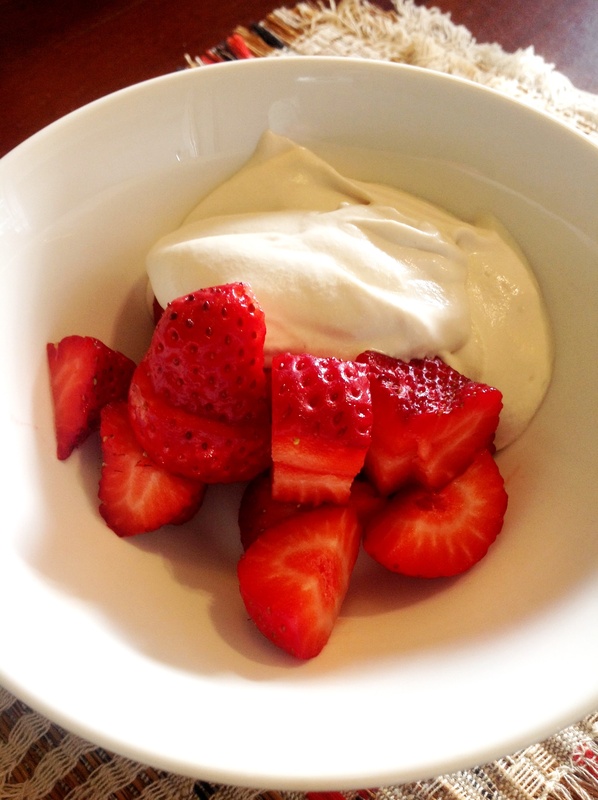 Whipped cream and strawberries: a classic no vegan should miss out on. Thick and voluptuous Cashew Coconut Cream, with strawberries. A classic! It’s easy and so worth it. Drain the cashews and blend in the cup of water until silky smooth. Add the syrup and vanilla and blend to combine well. Melt the coconut oil, if solid, and drizzle into the blender while you continue to whiz the cashew cream. Refrigerate until cold and thickened. And keep it refrigerated until you use it up. I reckon it keeps well for about 5 days. Then dollop onto fresh berries or fruit of your choice, heap onto pancakes with maple syrup, pile onto a trifle or cake (with shavings of dark chocolate sprinkled over) or pecan pie, or eat straight from the container like I do. I wonder what would happen if you put it into an ice-cream maker? Vary the amount of water for a thicker or thinner consistency. Experimenting our way to perfection (or at least excellence) is what life is all about.